In a dramatic statement delivered on Monday, House Speaker Nancy Pelosi and other Democratic leaders are calling on Minn. Rep Ilhan Omar to apologize for tweeting the strong suggestion that political donations drive politiciams’ support for Israel. In the dramatic statement, House Democratic leadership said that while "legitimate criticism of Israel's policies is protected by the values of free speech and democratic debate," Omar's "use of anti-Semitic tropes and prejudicial accusations about Israel's top supporters is deeply offensive." "We condemn these remarks and we call upon congresswoman Omar to immediately apologize for these hurtful comments," read the statement, tweeted out by Speaker Nancy Pelosi. Omar is facing fresh criticism and scrutiny, including from some of the most powerful members of her own party, after using language in a tweet condemned as a "vile anti-Semitic trope." The Democratic congresswoman shared a tweet Sunday on House Republican leader Kevin McCarthy pledging to take "action" in response to her support of movements to boycott and sanction Israel over its treatment of Palestinians. "It's all about the Benjamins baby," she wrote, adding a musical note emoji. The line comes from a 1997 Puff Daddy song and drew immediate criticism from local Minnesota and national leaders, with some issuing calls to remove her from her position on the Foreign Affairs Committee. Foreign Affairs Committee Chairman Eliot Engel said it is "shocking to hear a member of Congress invoke the anti-Semitic trope of 'Jewish money.'" Engel, who is a Jewish New York Democrat, did not address calls to have Omar removed from his committee. Locally, the Jewish Community Relations Council of Minnesota and the Dakotas condemned the tweet, saying the language "should have no place in politics." "Such rhetoric puts our community in danger," read the statement, which added that it's insulting "to falsely suggest that elected officials only support Israel because they are paid to do so." In a follow-up tweet, the freshman congresswoman said she was referencing the American-Israel Public Affairs Committee, a powerful pro-Israel lobbying organization. While all acknowledge that pro-Israel lobbying supports candidates in both parties, AIPAC is a nonprofit forbidden from making political candidate contributions. "We should expect all elected officials, regardless of party, and all public figures to not traffic in anti-Semitism," Chelsea Clinton, whose husband is Jewish, tweeted. Fellow freshman Democratic Rep. Max Rose of New York called the comments "deeply hurtful to Jews, including myself," according to Politico. Two other Democratic representatives wrote a letter to congressional leaders saying they are "deeply alarmed by the language," according to the Washington Post. "We urge you to join us in calling on each member of our Caucus to unite against anti-Semitism and hateful tropes and stereotypes," they wrote. GOP groups, including the National Republican Congressional Committee, blasted Omar over the remarks. Minnesota Republican Party Chairwoman Jennifer Carnahan called on Minnesota Democrats, including Sen. Amy Klobuchar, to denounce the remarks and said House leadership should strip the freshman congresswoman of her committee assignments. Sen. Klobuchar’s office has not responded. 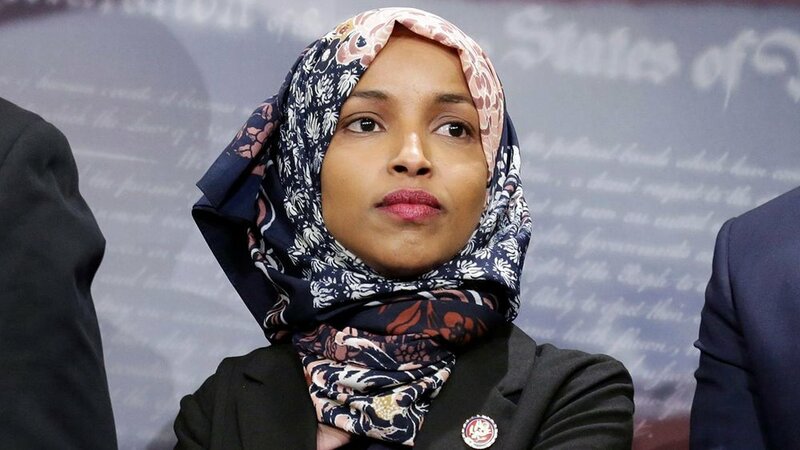 "It's clear that congresswoman Ilhan Omar harbors deep-seated anti-Semitic views," Carnahan said in a statement. "There's no place for this in Congress or among our Minnesota congressional delegation." "We completely agree with Ambassador Dan Shapiro that Rep. Omar's 'outrageous comments equating politicians' support for Israel with being bought off by American Jewish money are a vile anti-Semitic trope," the group said. "They need to be condemned by all in our party." The Minneapolis Tribune writes that Omar previously came under fire for her 2012 tweet saying "Israel has hypnotized the world" was also widely rebuked for using anti-Semitic stereotypes. Omar has since said that tweet, sent in response to reports of military action against Hamas, used "unfortunate words." Last month, she also faced criticism for suggesting, without evidence, that U.S. Sen. Lindsey Graham, R-S.C., remained a staunch ally to the president because he was somehow "compromised." Jonathan A. Greenblatt, CEO and national director of the Anti-Defamation Leauge, cited that record in joining calls for House leadership to respond, saying the latest tweets are "part of a disturbing pattern of behavior that must end." "Unfortunately, making insensitive statements toward the Jewish community is not new for Rep. Omar ... The congresswoman needs to understand that these comments promote dangerous stereotypes and are hurtful to her Jewish constituents and Jewish-Americans throughout the country," Greenblatt's statement read. A spokesman for Omar did not immediately respond to the Star Tribune's request for comment on the latest backlash. Her office told Politico that the tweets "speak for themselves."